Email marketing service and solution provider AWeber has announced the release of its new digital research tool Generation MEdia. The interactive research tool provides users with access to more than 90 million data points, culled from the survey responses of 1,342 millennials from across the country. "What you see when you look at the data from this tool is that some of the preconceived notions we have about millennials may not be entirely accurate, while in other areas they are validated," said AWeber CMO, Erik Harbison. "Either way, it provides a wealth of information in how millennials are interacting with the world and how they like to communicate." 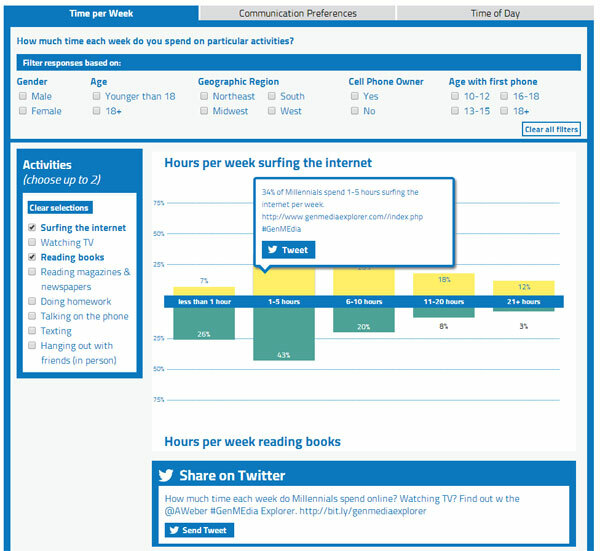 Not only does Generation MEdia tool allow users to look at a single data point at a time, it also lets users compare two or more fields of information in three different categories: time spent per week on an activity, communication preferences and the time of day various communication tools are used. Users can also easily share information by clicking on a specific data point and tweeting the statistic to their followers. It is also important to note that AWeber will update Generation MEdia yearly.